Alright. Okay! You've got me, those of you who think I see a Paul McCartney connection in everything. I'm at it again, and I'm not even into my third sentence. 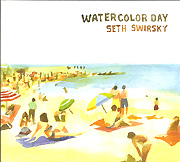 For it is multi-instrumentalist Seth Swirsky, whose new Watercolor Day album is my pick hit for hot summer listening on any day, in any season; in the house, in the car, in the beach front hut and in the garage while detailing your vintage Camaro (hey, can I borrow it sometime?). This is the album to beat this year for sheer pure pop pleasure, the high priest of melodic pop records, the toppermost of the poppermost... which leads me to my McCartney thing. And so it is that even on an album chiefly steeped deep in appreciation for the Boys of Summer (sorry Seth, none are named Maris or Mantle) and the sounds of yesterday that flooded favorite radio stations of our youth that I find the point of it all. It comes in the fade of the title track that leads off the album, a little ditty of a section that was part of a whole other song about Swinging London called "Jean Shrimpton," during which Swirsky rattles off, in his smoothly-honed tones, the names of the aforementioned Jean and, lo and behold (to quote a James Taylor song), there it is, your very first McCartney reference, the intoning of the name of our most honorable Sir, Paul McCartney, and it's not without purpose, for this is a collection of songs also steeped in the pleasures of melodic British Invasion pop, a musical melange of sorts, a tip of the baseball cap to the artful sounds of classic records that fueled the variously-shaped and sized radios of Swirsky's (and mine, and yours too) youth. Watercolor Day is composed of a Baker's Dozen plus an additional nickel's worth of songs that shimmer in the trappings that are usually more afforded to gold. Well, let's just say these songs are golden and bring those trappings along on our journey, which begins right at the beginning with the grand opening gesture that is "Watercolor Day," in which a person dreams the colors of a particular relationship that may or may not have been particularly sweet, a dream that turns to black and white just as the alarm sounds. "It's another watercolor day/I wish she would come outside and play," Swirsky sings, hoping the best of the dream would become real. The song begins with a perfectly-strummed acoustic guitar and quickly layers on bass; drums; real, honest-to-goodness string and horn sections; sweet background vocals, and co-producer Rick Gallego's mellifluous pedal steel. The pedal steel, in Gallego's more than capable hands, plucks just the right feeling at 1:58, a ringing, Rickenbacker-like trio of notes that will make your heart swoon. ... this is a collection of songs ... steeped in the pleasures of melodic British Invasion pop, a musical melange of sorts; a tip of the baseball cap to the artful sounds of classic records that fueled the variously-shaped and sized radios of Swirsky's (and mine, and yours too) youth. "Watercolor Day" is quickly followed by the gorgeous "Summer In Her Hair," a passage in time fitted into three and a half minutes of summery, melodic bliss. A girl, perhaps the one in the dream depicted in the title song, epitomizes all the colors of summer. Swirsky sings, "I don't want to let go." Who could argue? Swirsky's acoustic starts the song off, and various Beach Boys stylings fit into the mix, a delicate, comfy-as-a-snuggly-puppy sound punctuated by Rick Gallego's Coral sitar, ace utility player Probyn Gregory's trumpet, and just-as-ace record company exec (Now Sounds) Steve Stanley's crucial bass harmonica, another nod to Southern California's finest. The 35-second prelude to a song that appears near the end of the album, "I'm Just Sayin'," is next; an intro to the delightful, straight-ahead, Beach Boys-influenced pop song, "Matchbook Cover," which takes a few welcome tempo detours that enhance the song's loveability factor. For this one-man-band devotee, the realization that Swirsky plays all instruments and sings all vocals sweetens the deal. He performs the same A-to-Z duties (save for the string section) on the beautiful "Song for Heather," in which the vision of the dream girl in "Watercolor Day" becomes a bit clearer. But, no, here comes a brickish wall: in the next song the guy becomes "Distracted," with the sights and sounds of the day all vying for his attention. Gregory's flugelhorn and D.J. Bonebrake's vibes add a nifty and welcome Bacharach vibe to the proceedings. Are you getting the idea that Watercolor Day is an album that will reward the patient, dedicated listener whose ears take in these songs in a single listening session? It's true; if ever an album were designed to be listened to as a complete entity, first song to last, this is it. Not that cherry picking songs won't do the trick when you yearn for melodic pop excellence. Yes, cherry picking is allowed, but your best bet is snuggling up with the aforementioned puppy and letting the record play. One of this album's centerpieces is the lovely, beautifully-arranged "Movie Set," steeped in visions of activity at an underground movie location, Japanese restaurant and radio interview--slightly surreal visions riding on top of lush, nicely orchestrated and lead guitar-punctuated music. Another such centerpiece is the gliding "(I Never Knew You) Harry," a love letter to Harry Nilsson decorated with both vocal and instrumental Nilssonisms in a collective tip of the hat that is nearly as good as the real thing. Three short, quirky songs are book ended by the soft, shimmery, summery faux bossa nova of "Fading Again" and the pure pop delights of "Sand Dollar": "Living Room," about the loss that can be noted in certain rooms of a home; "4 O'Clock Sun," a lovely Southern California-themed instrumental that evokes the soul of Beach Boys music; and "Big Mistake," a seriocomic admission that "he'd be making a big mistake if he went back to her." The girl in the title song, perhaps? The fun, clap alongable "Sand Dollar," with its fanciful lyrics and childlike melody is the single that should be and one of Watercolor Day's standout tracks. Perish the thought that Swirsky truly loves silence as he sings in "20 Minutes to Myself"! What's next, a cover of John Lennon's "Nutopian International Anthem"? No, next is a pair of sixties-styled songs: "Stay," a tender examination of the need to love, the need to keep one's love at hand and never let it end; and "She's Doing Fine," an emotional song about the departure of a summer love that blocks the metamorphosis into coming seasons. God bless Probyn Gregory's haunting, ghostly trumpet that anchors this wonderful piece of music. Watercolor Day's penultimate track is a jaunty sprint of a summing-up kind of tune, the full version of the majestic "I'm Just Sayin'," which integrates themes from "Song for Heather," "Sand Dollar" and "Movie Set." It's a surprising turn, and something Paul McCartney would do (and there you go, another McCartney reference!). The song even nods to Klaatu's "Hope" at 2:14, with a beautiful vocal coda sung beautifully by Swirsky and Gallego. It seems almost impossible for an album so already perfect to cap itself off with a song that is heaven sent, that encapsulates the ultimate emotion, the feeling that the truth has been told, that what should be is. "Amen" is a standard-worthy Swirsky/Gallego cowrite, as pretty as pretty can be and, like "Watercolor Day," beautified by Gallego's sensitive pedal steel. It's a remarkable song that greets its listeners with peace and hope and ends the album on a dear note--that beautiful music is still being made by those who know how to make it. The trick is to seek it out because it won't necessarily find you. And if it takes a couple of Paul McCartney references to help make the match, then so be it. I have written at such length about Watercolor Day because I truly believe it is an album oh so worthy of your attention. It is a loving gesture from a professional musician with the purest of visions and a sincere desire to share that vision with the world's ears. Listeners of my generation, who were raised on a combination of Beatles and Sinatra and Roger Miller and the Beach Boys and Barbra Streisand and the Vogues and the Baja Marimba band know what I'm talking about. Listeners of my generation who were raised on radio stations that played all of these artists and more--stations that jump-started themselves with cross-musicalizational purpose--never expected to hear only one kind of music in their lives. The popularity of iPods enforces this: shuffle your music library and you never know what type of song you might hear, in which tempo, with or without harmonies. Watercolor Day is like one of those sixties radio stations, with its mix of styles and firmness of intent to deliver a program that will keep your ears fully interested and invested. Watercolor Day is a grand gesture; a monumental achievement, with or without its McCartney references or its Beach Boys touchstones. Your record collection isn't complete without it.